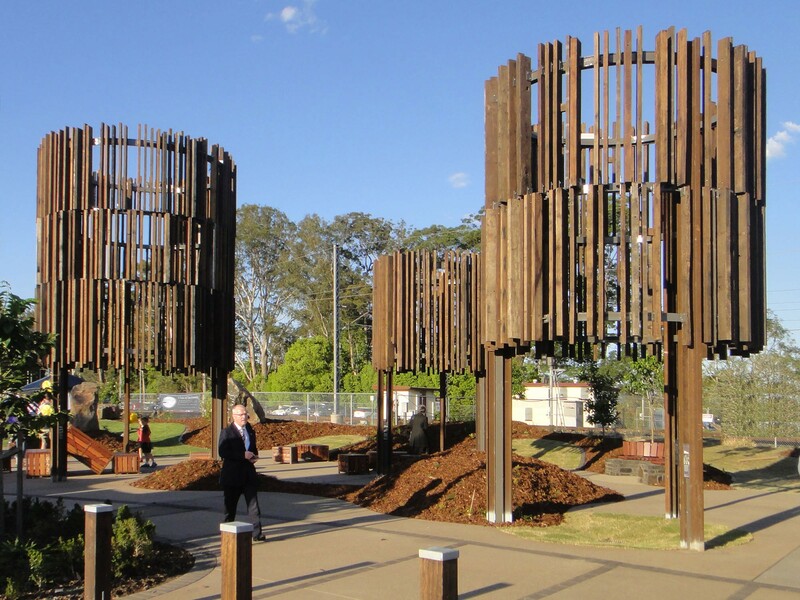 Beerwah Town Green has been designed as a series of public spaces specific to place and time of Beerwah and its future. 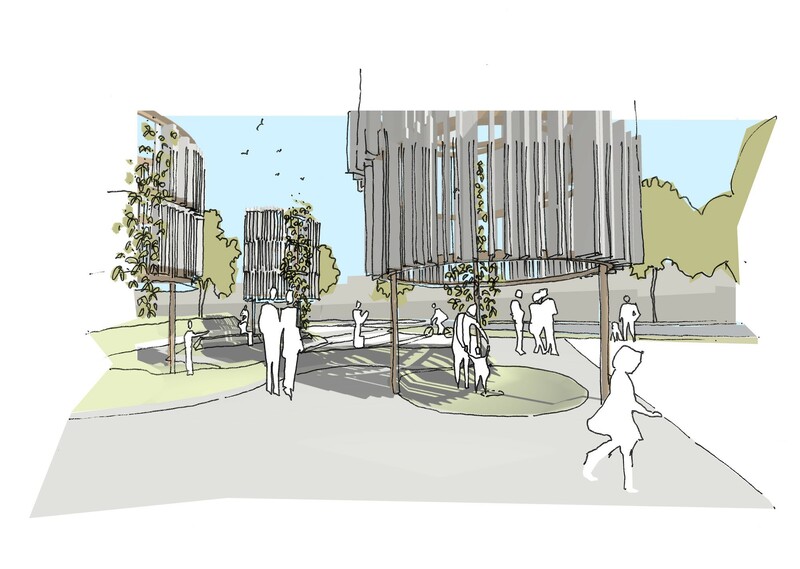 As part of the Beerwah Streetscape Masterplan, the Tower Green experience is an assemblage of contrasts and synergies between rocks, timber, vines and endangered butterflies. 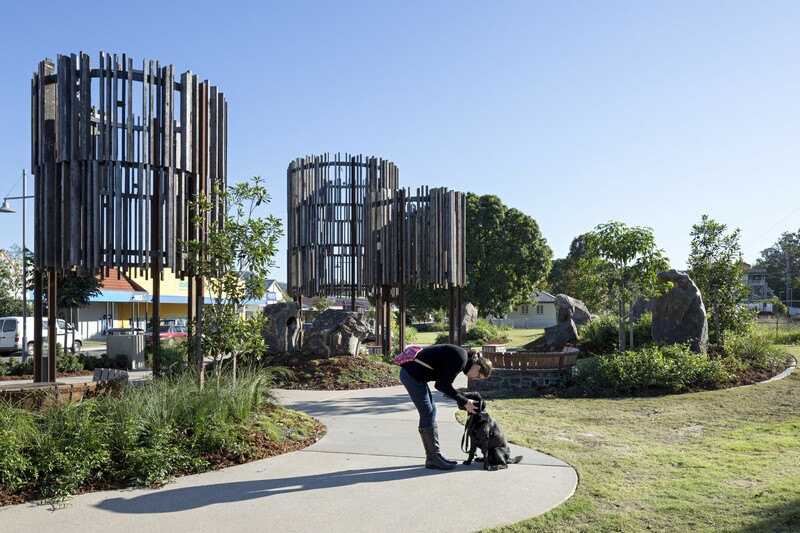 Mapping and layering Beerwah’s landscape, topography and stories informed the approach, ideas and principles that celebrate the sense of place at the The Circle. 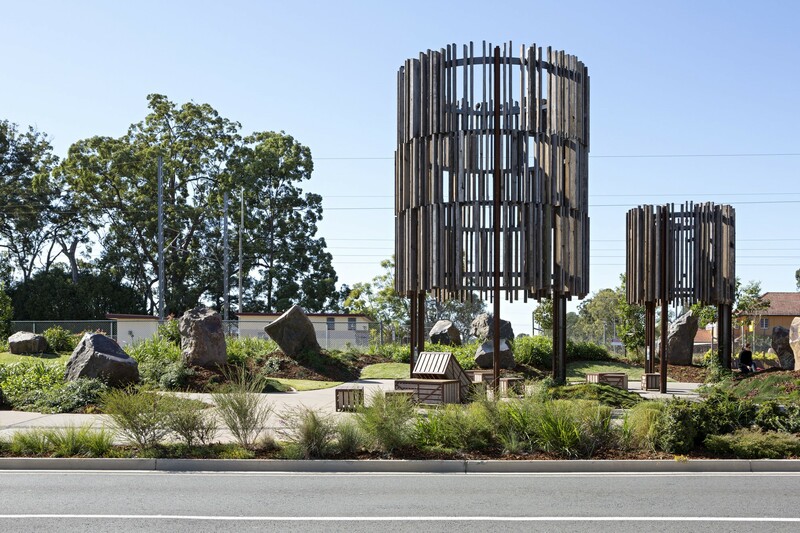 The rocks – also known as the ‘Silent Sentinels’, stand quiet and strong and form the undulating edges of Beerwah Town Circle, an organic and informal place which provides an inward focussed oasis for the people and butterflies in Beerwah. 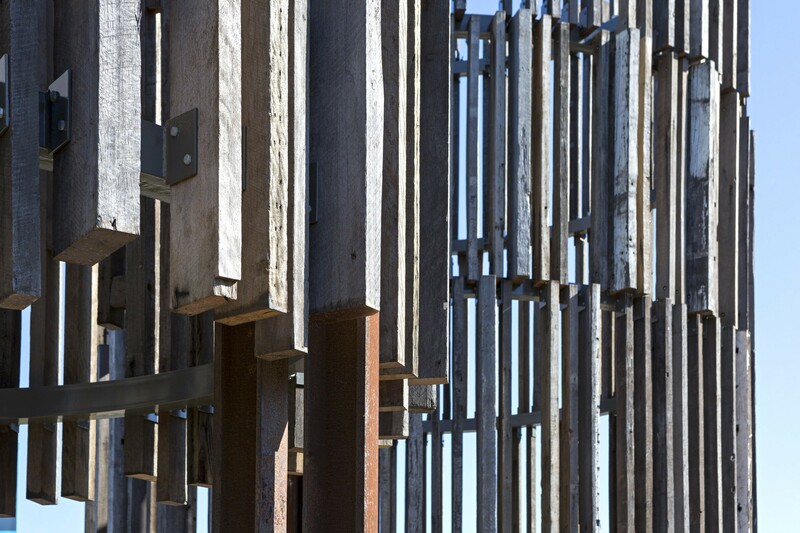 Like ancient warriors, the Silent Sentinels reference the magical strength and wonder of the Glass House Mountain topography, in their monumental stillness and weight. According to artist, Hew Chee Fong, “the quarry boulders carefully chosen for scale, shape and texture, minimally interfered with to retain ‘as found’ colour and texture”, with the “ground plane around and between each rock manipulated to express and enhance what potentially may lie beneath the surface”. 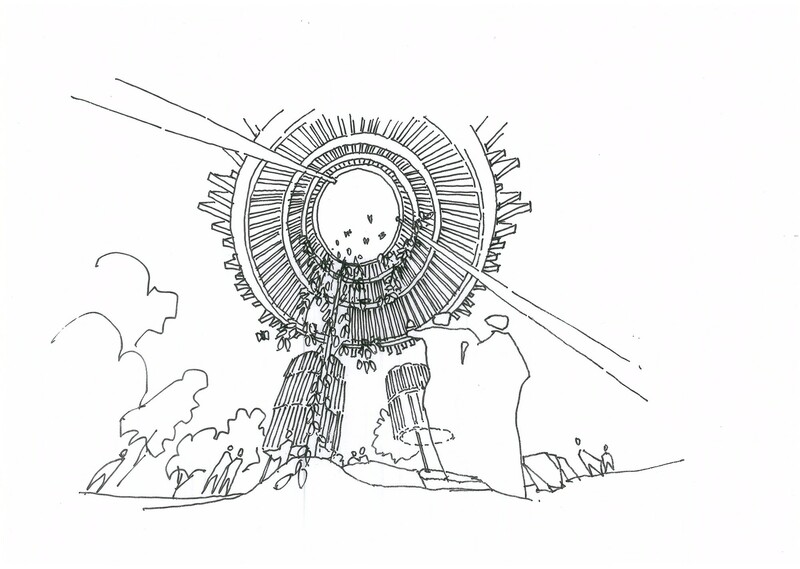 The Butterfly Towers by contrast breathe; they are light. They glow like warm lanterns in the evening when you arrive or pass on the train. 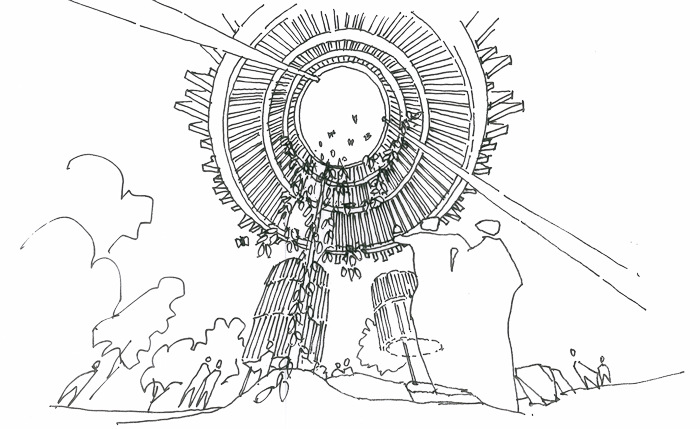 When looking up from underneath, they frame a sky portal to the universe. 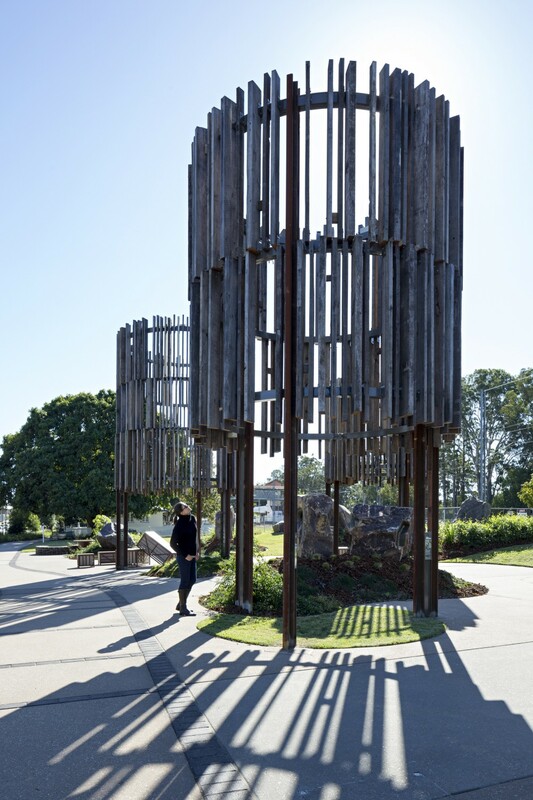 Permeable, slender and with a lightness, the Butterfly Towers echo the rudimentary structures, forms and materials of Beerwah’s agricultural history. 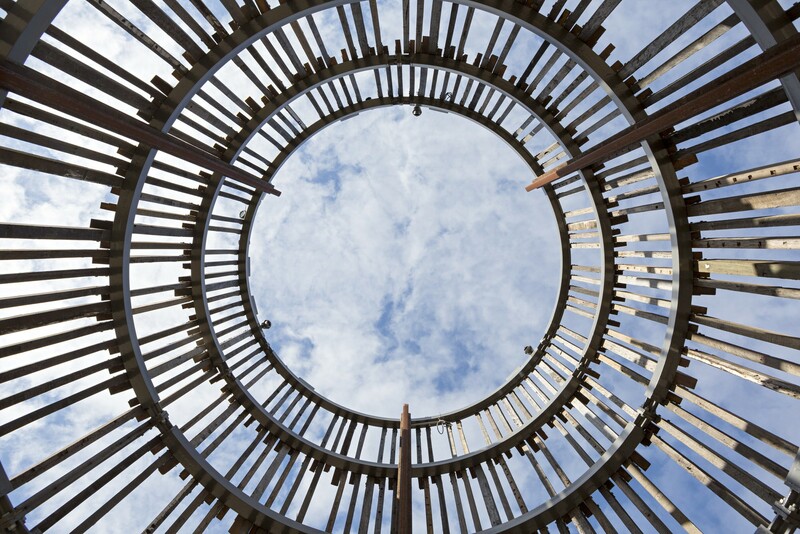 Providing shade for passersby, time is expressed through the changing patterns of their shadowplay cast onto undulating ground plane. 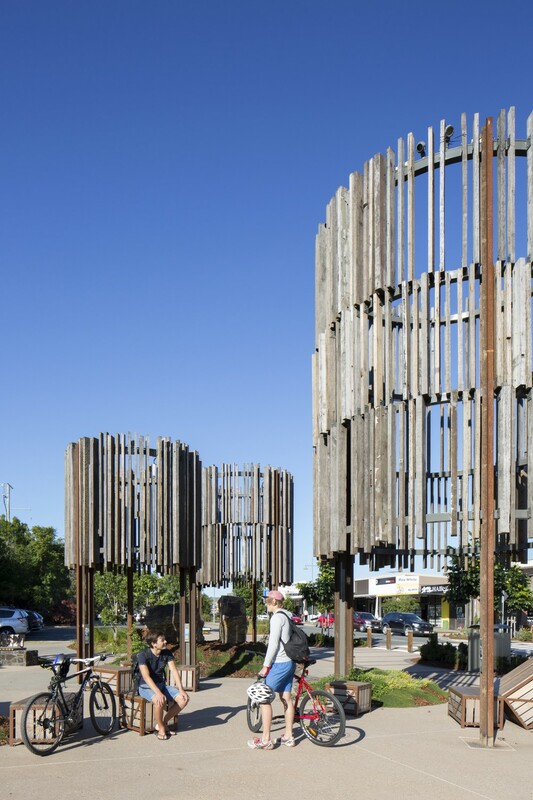 They are urban design markers in a wider landscape and act as wayfinding tools to locate the Town Circle. 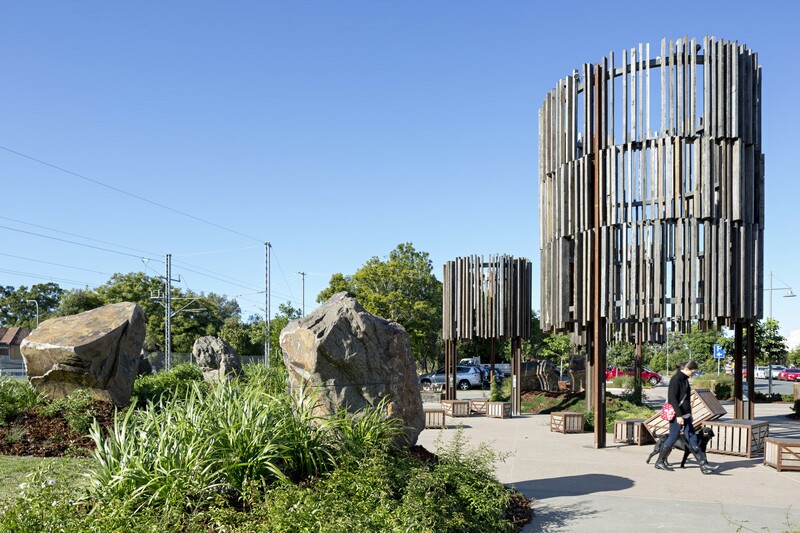 The Butterfly Towers support and encourage the growth of the Birdwing Vine, which is critical to the existence of the Richmond Birdwing Butterfly as its major food source. 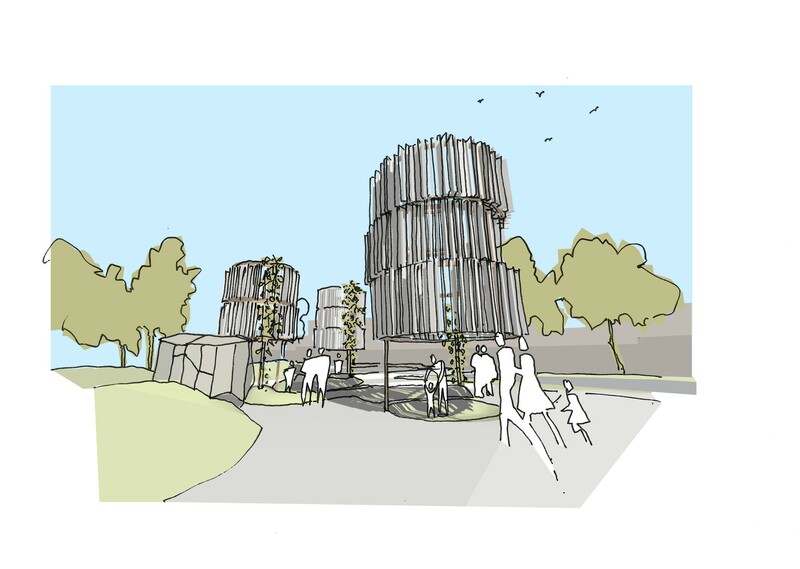 In this way, the Butterfly Towers are wildlife warriors, protecting biodiversity through guardianship of a species that ironically, saw a major decline in numbers through mass habitat clearing for the forestry and agriculture that sustains the region and its people. 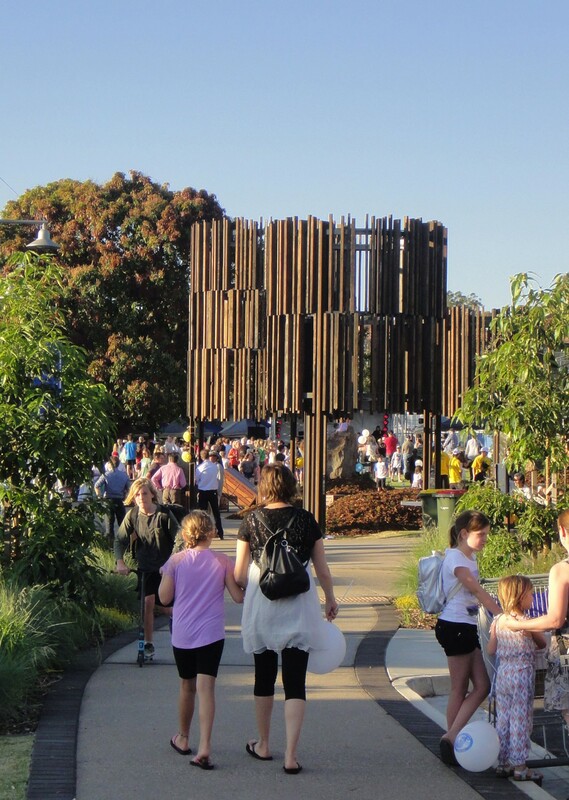 The Circle allows many readings and many references can be drawn upon from this new series of spaces, each specific to a place and time of Beerwah into its future.